Spartan Bioscience today announced an exclusive distribution agreement with MilestoneBio for distribution of the first bedside DNA test in Korea. Milestone specializes in the distribution of DNA-based diagnostic products, and will concentrate its efforts on reaching cardiologists in hospitals and other medical centers. The Spartan RX CYP2C19 is the first bedside DNA test in medicine. (1) It identifies carriers of the CYP2C19*2 gene, which is carried by approximately 30% of Caucasians and 50% of Koreans. (2,3) Genetic carriers who receive Plavix® (clopidogrel) following a cardiac stent have a 42 percent higher risk of death, stroke, or heart attack in the first year compared to non-carriers. (4) Over 1 million cardiac stent procedures are performed annually in the United States, compared with over 40,000 in Korea. Following this procedure, patients are typically prescribed clopidogrel for one year or more. In 2009, Plavix® was the second best-selling drug in the world, with over $9 billion in revenues. Spartan Bioscience is the leader in point-of-care DNA testing. 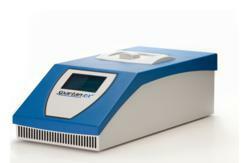 The Spartan RX is the first complete sample-to-result, point-of-care DNA testing system in medicine. It is a fully integrated DNA collection, extraction and analysis platform, with an intuitive interface that is easy to operate—no laboratory training required. For the first time, healthcare providers and their patients can get DNA results on demand. For more information, please visit our website at: http://www.spartanbio.com. The Spartan logo is a registered trademark of Spartan Bioscience Inc.
Plavix is a registered trademark of Bristol-Myers Squibb/Sanofi Pharmaceuticals. 1. Roberts JD et al. (2012). Lancet. Published online March 29. 2. Damani SB, Topol EJ. (2010). J Am Coll Cardiol. 56:109–11. 3. Jeong YH et al. (2011). Circ Cardiovasc Interv. 4(6):585–594. 4. Mega JL et al. (2009). N Engl J Med. 360:354–62. 5. Wiviott SD et al. (2007). N Engl J Med. 357:2001–2015.